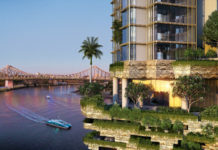 Developers are moving to fill a gap in demand for medium density developments in Brisbane’s established suburbs. The latest cab off the rank is a large new master-planned development located at 38 Ivedon Street, Banyo in Brisbane’s north eastern suburbs. Known as Summerlin, the development comprises of terrace homes and apartments as well as 4000 square metres of communal park area with a pool and gym. The first stage of the project will be 26 townhouses which are situated in a former light industrial precinct. The landscape design work for the project has been crafted by Landscape Architect Lat27. Lat27 Landscape Architect Miles Daly says that with increasing urbanisation of suburbs like Banyo, the open space offerings by developers are fundamental to the liveability and overall success of projects like Summerlin. “Developers are also understanding that the way a building lands in the streetscape and how it is presented at a human scale is critical”, he said. Designed by Rothelowman, the design of the development has been styled in a way that preserves a quaint post-war theme, illustrated by the use of weatherboards with a contemporary interpretation. Rothelowman senior associate Lawson Royes describes the project as a significant urban infill project for Banyo, also housing the suburb’s largest mix of terrace homes and apartments. “The townhouses have been designed as a lightweight construction sensitive to their proximity to the Ivedon Street frontage, articulated by light and dark forms with screening elements,” Royes says. 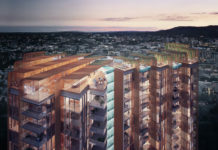 Denis Family Corporation Spokesperson Ben Langfield said there has been a noticeable increase in demand for medium density developments offering townhouse, terraces and low rise apartments with good access to transport corridors and inner-city amenities. “We are also seeing a re-emergence of first home buyers in our sales enquiries and activity. The majority of purchasers to date in our initial release of terrace homes at Summerlin have been first home buyers. 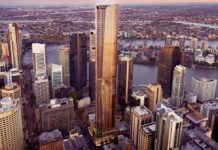 A contributing factor towards this trend has undoubtedly been the increase in the First Home Buyers’ Grant to $20,000 since July this year,” Langfield said. Stage 1 at Summerlin is scheduled for completion by mid-2017. The DA number for this development is A003852444.